I applied for the Canadian Battlefields Foundation’s study tour after discussing the opportunity with a couple of my professors (Dr. Milner and Dr. Windsor). They both believed that this would be a great opportunity as my thesis tied in with the trip. When I received the phone call telling me that I was picked for the trip I was ecstatic. I was so excited that I was finally going to Europe and to be the first in the family to go on this very special journey. After the initial excitement that I was going subsided, I came to the realization of how important and special this trip was going to be. In my application, one of the reasons I explained for wanting to go on the trip was the family connection I had. My great- great uncle George participated in the Normandy campaign and landed with the Royal Winnipeg Rifles on Juno Beach. He was captured two days later during the battle of Putot-en-Bessin. He, luckily, was not executed like so many others on that day. Instead, he spent 11 months as a prisoner of war before he was liberated by the Americans in May 1945. My uncle George did a Veterans tour in 1994 and was present at Juno Beach for the 50th Anniversary. 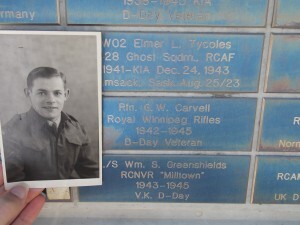 I have pictures of him at the beach and at the Royal Winnipeg Rifles’ memorial. I knew those were two of the places that I needed o visit on my travels. I would also be able to see his brick at the Juno Beach Centre that his daughter had bought for him. I was looking forward to getting some pictures to send back to her since had never seen the brick before. It was only after this initial excitement had subsided that I realized that 20 years later that I would be going on a larger scale tour that uncle George had completed. The realization that it was 20 years between tours really hit me. It was though things were coming around full circle by this trip. I had numerous family members tell me that he would be so proud of me knowing what I was doing. When I arrived in France, I was beyond excited. I tried to take in as much as I could; however, I was anxiously waiting until we got to our Normandy Base. I knew when we got to the beach it would be emotional. 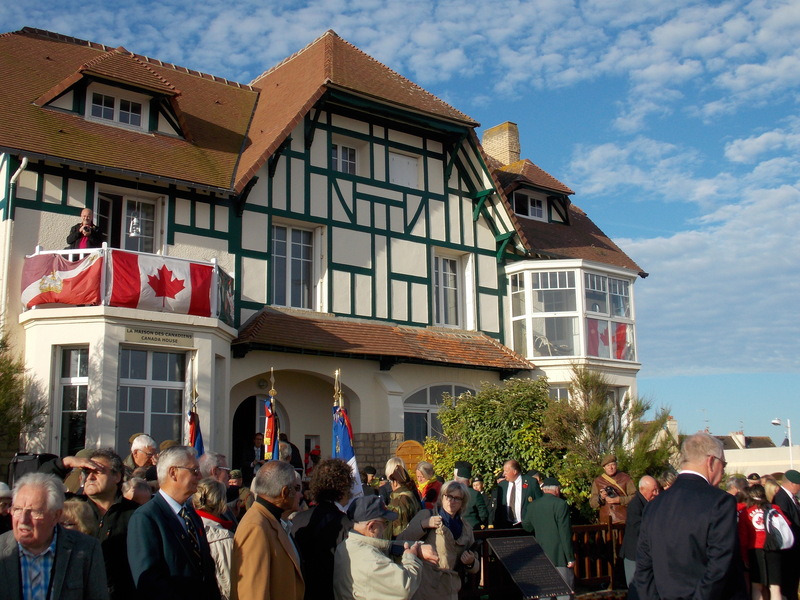 The morning of June 6, we headed to Juno Beach for the first of three ceremonies that day. The first ceremony was at the Queen’s Own Rifles house (now called Canada’s House). It was a touching ceremony. 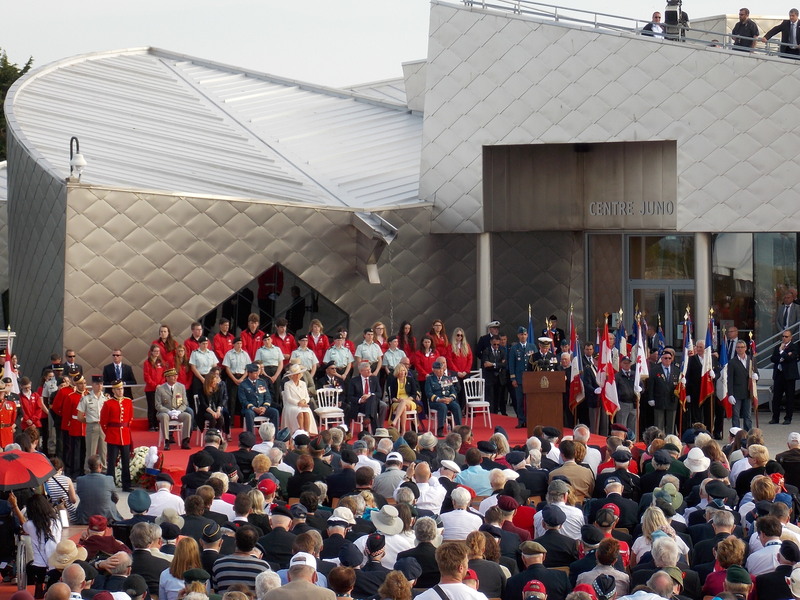 There was a large crowd gathered and there were current of the QOR as well as two French youth who pledged to carry the torch of remembrance for all the Canadians who gave their lives. After the ceremony, we had a little time to explore before moving on to the next part of the day. Most went to the beach to explore. It took me a few minutes before I could actually set foot on the beach. I was about to set foot on such hallow ground that I was overcome with emotions. My thoughts went to what my uncle George would have had to endure that morning and the countless other men. I was luckily to have the support of my tour mates, as they rushed to hug me when the tears started. It was reassuring to have the support of the girls when I needed it the most. The main ceremony at the Juno Beach Centre was impressive. The amount of people there to commemorate this anniversary was overwhelming. I had never seen so many people there to remember the sacrifices that so many of our men gave. It was a proud moment being there and being a Canadian. Both Prime Minister Harper and His Royal Highness Prince Charles gave wonderful speeches on the efforts of the Canadian Army and the sacrifices that were given. I also enjoyed hearing Major-General Richard Rohmer’s D-Day story again. I really enjoyed meeting him the previous day at the Beny-sur-Mer ceremony. Hearing his story made me again think of my uncle George and what his thoughts would have been for this ceremony. It would have been interesting to compare his experiences at the 50th anniversary ceremony to mine at the 70th anniversary. One big difference was the amount of veterans of the campaign. There would have been significantly more veterans at the 50th anniversary than the 70th. Even Major-General Rohmer stated that this anniversary would be the last decade ceremony that would have veterans present. I felt very lucky knowing that I was able to meet some of these veterans and hear their stories. While June 6th was an emotional day because of being the first time at the beach, two days later turned into another emotional one. The day turned into the Royal Winnipeg Rifles day. We started at the section of the beach that the Winnipegs landed. It was surreal standing on the beach that uncle George landed on. It was hard to focus on Jordan’s presentation on the 7th Brigade because my mind kept going back to him and wondering what had been going through his mind when the door of the landing craft went down and he had to get up the beach. I brought some pictures of him with me so I could have pictures taken with him once again. It felt like, by doing that, he was back with me. 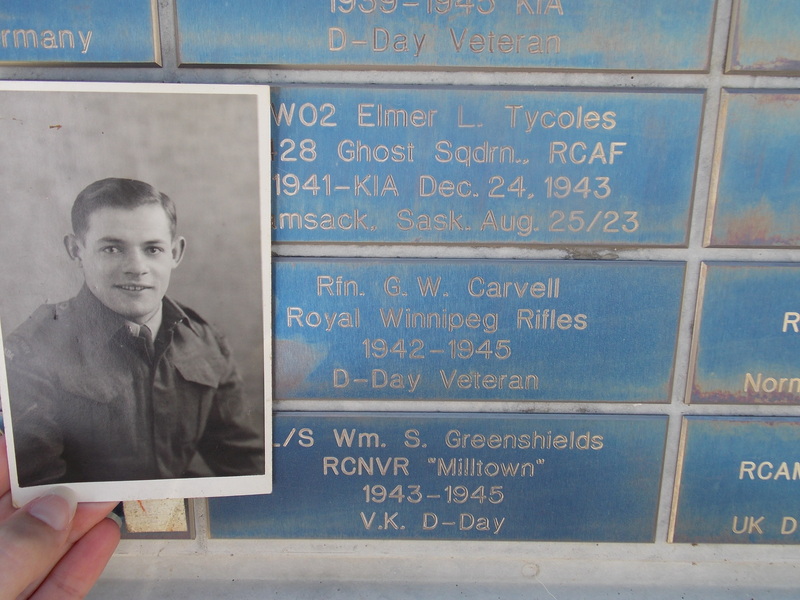 When we got to the Juno Beach Centre, I was easily able to find his brick and get some pictures with it. I brought one of his pictures from when he was 19 to place with the brick. After a tour of the centre, we headed to the Royal Winnipeg Rifles memorial. I had pictures of uncle George at that memorial so that was one place that I needed to visit on the trip. I also got an arrangement of flowers to lay at the memorial. The only thoughts on my mind were my uncle and how 20 years ago he was at that place. It was an honour to lay the flowers there in his memory. The emotions were overwhelming when I placed the flowers. Again, I was lucky to have such wonderful support from everyone I was with. We got some wonderful pictures while there and it felt great that I was able to be there. 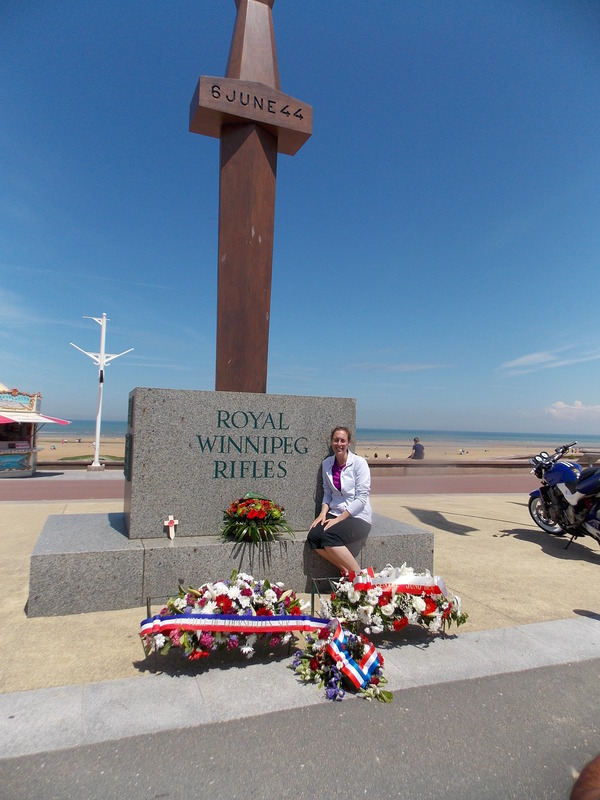 We got a few group pictures at the memorial before heading inland to discuss the D-Day + 2 battles. When we arrived at Putot-en-Bessin, I did my last presentation on the efforts of the Royal Winnipeg Rifles during this battle. When we were picking out the presentation topics, Dr. Milner told me that I had to do one on the RWR at Putot since I had the connection there. It was amazing to be on the land that uncle George was captured on. It has been difficult to describe what it was like being there. I found that with all the battlefields. It was hard to describe the affect knowing that so many people lost their lives on the grounds. I found it hard to comprehend being there knowing that this ground was the beginning of the 11 months of Uncle George being a POW. This tour really did complete the circle for me and my family. I was able to honour the memory of my uncle and show my family the area that played such an important role in his life. This tour will also be reflected in my thesis. It wasn’t until I was able to actually see these sites that I was able to truly understand what the men went through and some of what my uncle experienced.